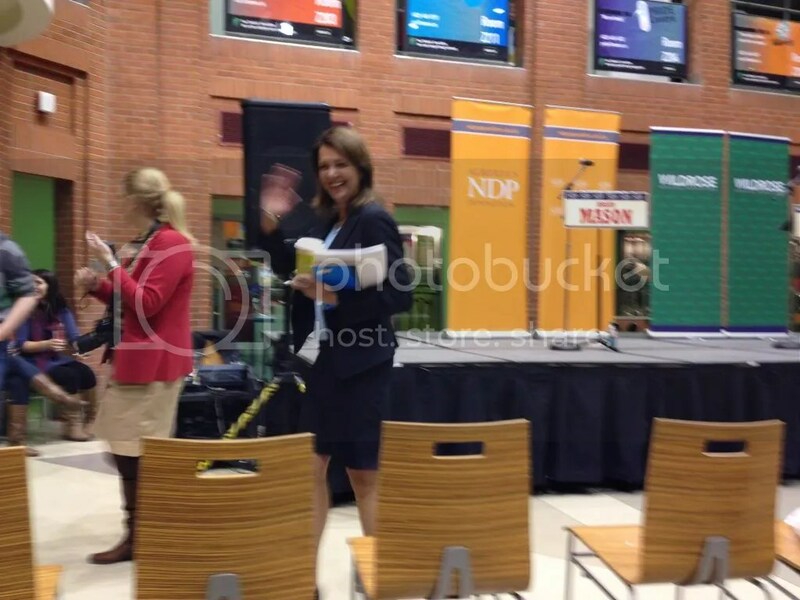 Mount Royal University was hosting the ninth and final debate between Wildrose leader, Danielle Smith, and NDP leader, Brian Mason. We expected to see sinewy kickboxers pouncing on each other in the fighting cage. Instead we got two respectful politicians (an oxymoron?) who were able to disagree without being disagreeable. They were entertaining, informative and downright funny. Mason conceded the starting position to Smith because he always lost at “rock, paper, scissors”. Smith surprised Mason by leading the crowd in singing Happy Birthday Dear Brian halfway through the debate. After 40 plus years of continuous rule the PCs have become corrupt, arrogant and a transparent as a brick. 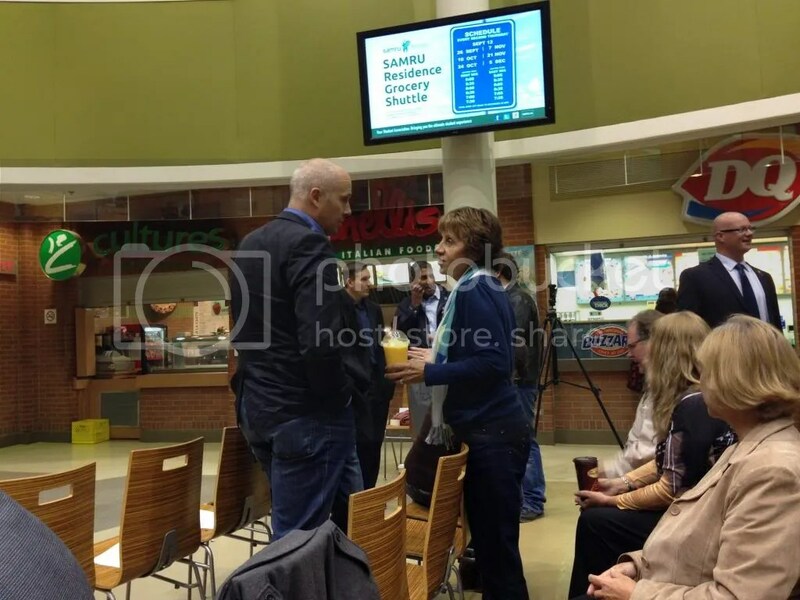 Smith and Mason used the debate to preview their competing visions for a PC-free Alberta. Not surprisingly, they were aligned on what needed to be fixed—healthcare, education, a balanced budget, economic priorities, global warming, land owners’ rights—but were at opposite ends of the spectrum on how to fix it. Smith demonstrated an economist’s unfailing faith in the power of the market to find social solutions while Mason held firm to the altruistic belief in an individual’s willingness to support the greater good. Smith and Mason ravaged Redford’s use of the Bitumen Bubble to explain the budget deficit. Smith called it the “unicorn of Alberta politics”. Mason was more blunt—it wasn’t a mythical beast, it was simply “bull”! Alberta’s oil and gas prices have always been lower than world prices. The Bitumen Bubble was a feeble effort to disguise the fact that the PCs have no strategy to ride through the “bust” part of a boom/bust cycle. So how would the WR or the NDP fill the hole in Alberta’s revenue stream created by a cratered natural gas market and low oil prices? Pipelines: Both leaders favoured more oil pipelines, however Mason argued that Alberta should export upgraded crude and refined products in order to maximize the value of the resource and keep jobs in Alberta. Smith responded that upgrading is uneconomic and would force the government to subsidize refiners. This would be costly and unnecessary because the market is willing to export oilsands bitumen now. Taxes and royalties: Mason would reverse Klein’s flat tax so everyone pays their fair share. He’d increase royalties on oilsands production, but not on conventional oil, and augment these revenue sources with capital borrowing to fund public infrastructure. Not surprisingly Smith rejected any increase in taxes or royalties for fear that this would drive business out of Alberta. Instead she’d implement a Natural Gas Strategy to switch from coal-fired to gas-fired power generation, push hard on bitumen export pipelines, invest in the Heritage Savings Trust Fund to fill a gap in revenue when royalties are low and—now this was interesting—push for changes the federal equalization payment structure to decrease support for, say, Quebec. She also rejected capital borrowing because once a government goes into debt it stays there. University funding: Smith proposed a funding model based on a university’s ability to compete for students. Universities that attract more students would get a bigger slice of the budget than those that don’t. Mason argued that education should be valued for its own sake and forcing universities to compete would detract from the primary objective of teaching while at the same time killing smaller institutions that can’t afford the bells and whistles necessary to make them more “competitive”. Healthcare: Mason laid the blame for AHS’ death spiral at the feet of former PC health minister Ron Liepert who adopted a corporate healthcare delivery model complete with a fatcat board of directors and overpaid executives, and argued that structure and pay scales should reflect the public, not private, sector. Smith promoted patients’ choice. Funding should follow the patient under a decentralized healthcare delivery model with decision making occurring at the local level. While she supports a publicly funded healthcare system she’d allow healthcare to be privately delivered. The debate around global warming and the legalization of marijuana pushed some hot buttons, but not the ones I expected. The debate around the legalization of marijuana was equally enlightening. Both leaders scoffed at Redford’s rigid refusal to consider decriminalization. Mason supported decriminalization but would hold off on legalization until he’d had time to consider the impact of legalization in Colorado and Washington. Smith said her caucus was evenly divided on the issue—eight favoured decriminalization and eight were against it. Smith supported decriminalization if for no other reason than prosecution was a waste of resources. Mason seized upon the 50/50 split as proof that the Wildrose were one-half libertarians who didn’t care and one-half social conservatives whose heads would explode. Smith responded that unlike the NDP who are controlled from on high, the Wildrose party believes in the free vote. If the party does not have a policy with respect to an issue then MLAs are free to vote in accordance with their constituents’ views. 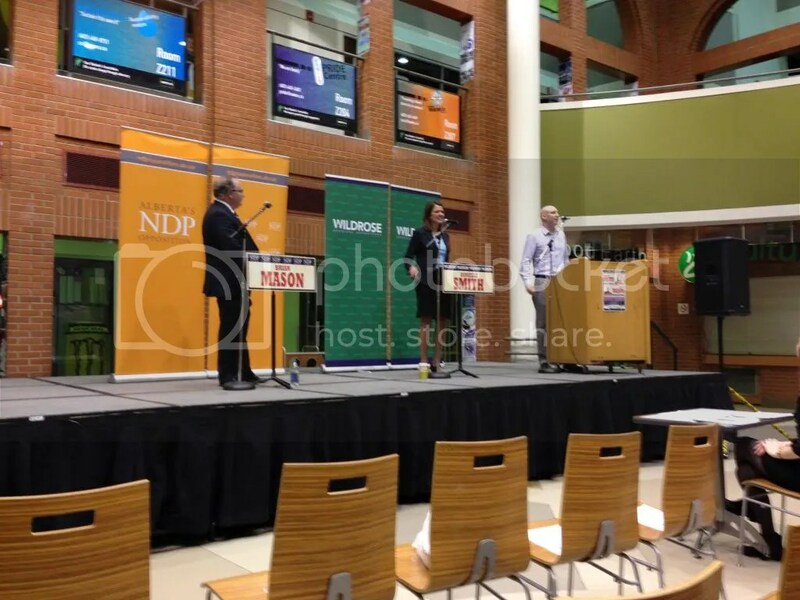 After “measuring” the level of whooping, clapping and shouting, the moderator declared Danielle Smith to be the winner. Smith accepted the win with humility, pointing out that the NDP had won six debates, the Wildrose two and they’d tied one. I voted for Smith, not because I support her policies, but because she did a better job of explaining her vision. Let’s face it. It’s easier to explain the “economic” theory of government—the free market is efficient and works (even when it doesn’t); than the “greater good” theory of government—public goods are for everyone’s benefit and we should all pay our fair share. Now consider this for a minute. Mason and Smith gave us a taste of their pre-election rhetoric: Mason is positioning the Wildrose as a party packed with crazy social conservatives who take their marching orders from Big Oil. Their goal is to privatize public services until the profit streams dry up and the public sector collapses. 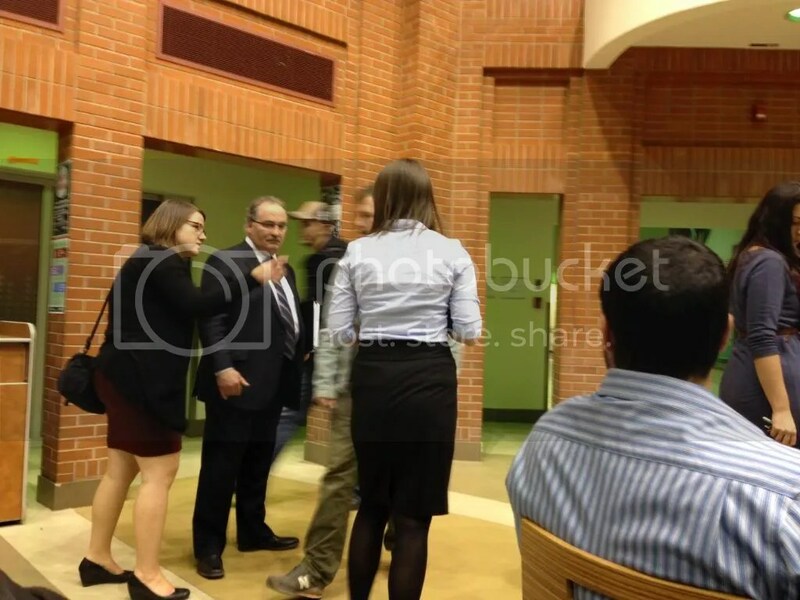 Smith will paint the NDP is the Central Planning Party that takes its instructions from the “boss” Thomas Mulcair. They will raise taxes and royalties until they’ve succeeded in driving away business and strangling Alberta’s ability to fund public services. Given these extreme positions from opposite ends of the spectrum there’s a void in the middle that could be filled by the progressive parties if they could just get their acts together. Over to you Raj Sherman, Greg Clark, and Janet Keeping. This entry was posted in Alberta Health Care, Education, Energy & Natural Resources, Politics and Government, Uncategorized and tagged Brian Mason, Danielle Smith, Greg Clark, Heather Forsyth, Mount Royal, NDP vs WR Debate. Bookmark the permalink. Very interesting post, thanks Susan. But isn’t decriminalization of marijuana up to the federal government? I’m interested in whether either Mason or Smith talked about federal vs provincial powers in that context. Jennifer, you’re absolutely right, decriminalization of marijuana is a federal matter, totally outside provincial jurisdiction. Smith said as much before informing us of where she and the WR caucus stood. Mason didn’t raise the jurisdiction issue but I’m pretty sure he (and Redford for that matter) know that there’s nothing they can do at the provincial level with respect to legalization or decriminalization. It’s interesting that the leader of the WR has a more “progressive” view of the issue than the leader of the Progressive Conservatives. But then again the whole “conservative” side of Alberta politics is mystifying. Mr. Soapbox was dragged to the above noted event, due in part to his night vision (whereas Ms. Soapbox has great vision and insight, she is lethal on the road at night!). For all of my muttering and repeated whining about “Do you really want to go?” I’m glad she stuck to her guns as I found myself quickly drawn into the debate and had my faith in provincial politics re-energized. I had become so tired of the present government, its arrogant and bullying style, its lack of forethought and rationalizing of self serving “decisions”, I wrongly assumed this debate would take on a similar quality…boy was I wrong. Both Danielle and Brian displayed a heartfelt respect, even love of our province and outlined how they saw us moving forward once the PC’s have been disposed of. I found much to like in each of the ideas being floated out for us, but want to discuss two in particular. The first one dealt with how much processing of bitumen should occur in Alberta. Danielle said that we could not match the labour requirements and that the capital investments would be too high. I like the concept of “value added” economic growth as compared to just increasing output of mining the oil sands as it is more sustainable. By way of a simple example, if we were a forestry economy, I do not want to ship an unprocessed log to America, but rather would ship a finished piece of furniture. This process of adding value to the base product has many ripple effects. First, we gain from additional investment and jobs right here at home. Secondly, the value added stays in the province and generates even more spin off or multiplier effects. Thirdly, shipping of processed products reduces the potential for harmful environmental damages (pipeline ruptures, tanker groundings) with the more lethal bitumen products. Lastly, we can control and enforce higher environmental standards right here at home in the processing of materials and in fact re-acquire our reputation as an environmental sensitive steward of our lands. If companies do not feel they want to invest in infrastructure, then they may not be the right people to extract our resources. I think from an economic and environmental standpoint, this should be more closely examined. The second issue surfaced when Brian indicated he did not believe in competition at the university level. I was a bit confused and wondered if we might have different concepts of what competition might mean. If I think of how we are handling seniors care in the province and outsourcing it to out of province private companies, I see that as unhealthy competition. The objective of that game sees companies attempting to shave costs while increasing profits at the expense of our seniors. However, if different universities are competing to attract the best engineering profs (and students I would assume), all universities would pick up the pace, much like playing against a better tennis player. All in all, both parties displayed a civility and a depth of understanding of the issues facing Albertans. It is unfortunate that we have to wait another 2.5 years to try one of these models out. Meanwhile, we need to keep the pressure up on the present government to ensure they don’t cause too much irreparable damage and to remind them to occasionally think about the public interest that we have entrusted to them. Mr Soapbox–may I call you Roy–I really liked your comment that if companies don’t want to invest in infrastructure then perhaps they’re not the right companies to extract our resources. It certainly signals a lack of commitment to Alberta and its people. Also given Ms Redford’s continual references to Peter Lougheed as her mentor you’d think she’d give serious thought to his recommendation to do more upgrading in Alberta. I understand that the government may have to kick in some assistance but it may be worth it in the long run. I too was confused by Mr Mason’s comment about competition in the university setting, particularly since the example he gave in support of his comment was an Edmonton elementary school example. He said that the bigger schools would force out the smaller schools because the bigger schools had more money and could offer more optional services. You and I both know from our experience with the Briar Hill elementary school that this is not necessarily the case. Briar Hill was a tiny public school with an excellent principal and teachers. Parents fought to send their children there. Size in and of itself is not relevant. It’s the quality of the teachers that counts more than anything. Oh and before I forget, thank you for taking me to the debate–I KNEW you’d enjoy it! I totally agree with the first point very clearly explained by Troy but as far as the University competition I am not so sure. As far as Bryan Mason and Danielle Smith, I honestly think that Bryan is an honest man and I think that he has not been able to evolve much in his role as a leader. It is not an easy job especially when it is in Alberta where people fear left wing politics as much as the plague. As far as Danielle Smith I am not so sure. I certainly would not turn my back to her. Alison Redford is not any better but D. Smith comes from the same political/religious background as Harper and I just do not trust them at all. Extreme right wing politics are as shaky as the extreme left. Too many nuts survive in those waters. Julia, I loved your comparison of a clear cut regulatory with firm parenting and agree that industry and the public would feel much better about exploiting our natural resources if we trusted the regulator to properly consider the applications put before them and allow all the public input necessary to be ensure that all concerns have been raised and addressed. Carlos, I hadn’t thought about Mr Mason in quite that light–that he hasn’t had an opportunity to evolve as a leader–you’re probably right, given the challenge of holding on to his supporters it would be difficult to be seen to accede to business interests in any way. I’m not as worried about Ms Smith saying one thing and doing another, seems to me she’s been crystal clear about where the WR stand on free enterprise and the privatization of public services. My concern is that I don’t believe that the public interest can be served by the free enterprise/competition model. I agree 100% with your comments about Harper. I’m reading Harperland and am stunned by how ruthless this man is. It will be interesting to see whether Duffygate will finally bring his government to its knees. Susan what I meant about Bryan Mason is that he has not been able to evolve within the new political environment. What you suggest is absolutely true for any left wing party in Alberta but my point is that Bryan just cannot find his way to a more independent position from the old left wing policies which in my view are as difficult to implement as the very extreme right wing policies of people like Danielle Smith. I do not blame him. In our changing world with 10 fold increase in power by the corporations and elites around the so called first world, having an independent party supported by people like me and you is obviously impossible and the Alberta party is a clearer example of that, but having the NDP with strong connections with unions is dead in the water. We all know that, but Bryan knows very well he does not have a choice because they need the financial support. I also think that he is a bit stuck in that kind of mindset of the old left wing politics. Not that they are wrong by any means but one has to be way more independent these days in order to survive in the highly complex and sophisticated society we live in. People are just not interested enough to get involved to the level that it would make a real difference politically and especially financially. Having an independent progressive party is, right now, the political holy grail. So in the meantime the slow but steady forward move of extremely rich and powerful system of dark politics continues unabated. Fortunately there is a fast growing radical movement that seems to be the only possible counter balance. In the situation we find ourselves I do not think that is negative. Throughout history that is the most common end to serious injustice. Margaret Mead said, and I agree, that it is always a small group of citizens that makes big important societal changes. I believe you when you say that Danielle Smith is now clearer on her political views but I still doubt that she is talking reality. If you look at her background it is almost inevitable that she has a hidden agenda that she knows very well she cannot be made public. Her more anxious colleagues did and caused the big loss in the last election. Another example is what we are now witnessing at the Federal level by her mentor. Scandals never seen before in Canadian politics caused by the lack of transparency and honesty so evident in this extreme right wing by stealth type politics. Lies and tricks to implement whatever they want to hide from the public is the common attitude. We see that with the trade deals, the omnibus budgets no one can read and understand ….etc. The Mike Duffy affair is just one of them but the 3.1 billion that disappeared from our annual budget is way more important and not much talked about. I strongly believe that the new CSIS building in Ottawa where the increase on public spying is happening is definitely where this money went. The government could not justify that expense so they went ahead anyway and they are now also doing corporate spying for the elites. What else they will do is anyone’s guess. Carlos, you mentioned the Mike Duffy affair. You probably saw the news reports today where Senator Patrick Brazeau says he was offered a “back room deal” of lesser punishment in return for some form of apology. Looks like the Senate, that chamber of sober second thought, has lost all credibility. The media has been focusing on the story (which is a nice change) and the PM’s responses don’t make much sense. Wouldn’t it be ironic if the prime minister who’s done the most damage to the separation of powers (executive, legislative and judicial) is finally hoist by his own attempts to manipulate the structures of Parliament.